An urgent appeal has been launched to help the widow of a former regional press journalist after revealing she may have to leave the country with their baby daughter following his sudden death. 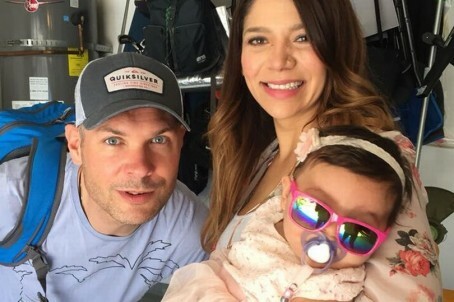 Tristan Nichols, who spent 14 years in total with Plymouth daily The Herald, died suddenly last Friday aged 40 – leaving behind his Mexican wife Jacky and their four-month-old daughter Mia Luna. Jacky has now opened up to Tristan’s old newspaper about the “nightmare” scenario she is facing, saying she is worried about how she will make the next mortgage payment on the family’s “dream house” in Saltash, Cornwall. She is also not yet a British citizen, and now fears she and Mia may even have to leave the UK. Tristan, who won several awards during his career for his work as The Herald’s defence reporter, left no will or insurance cover, and Jacky is unable to access cash from his bank account at present. Now a fundraising campaign to help Jacky and Mia has been launched, with more than £7,500 being raised in its first two days. Jacky told The Herald: “I want to stay in this country and I want to save this house – it’s where Tristan wanted Mia to grow up. I don’t know what my financial situation is. My life is up in the air, nothing is sure any more. Tristan finished the first of his two spells at the The Herald in 2012 to live in Tijuana, Mexico, after he met and fell in love with Jacky, who had been in email correspondence with him for seven years. While living in Mexico, Tristan worked as a news anchor for U-T TV, based in San Diego, before returning to England with Jacky and undertaking a second 10-month stint as The Herald’s defence reporter. Since 2015, he had worked as the Royal British Legion’s South of England public relations officer. Industry figures who have backed the fundraising campaign include Birmingham Mail editor Marc Reeves and former Herald journalist Susie Boniface, also known as ‘Fleet Street Fox’. More than 150 people have so far given to the campaign. To donate to the appeal, click here. Jacky is also receiving help from Tristan’s brother Jon and mother Carol. His father Gerry died in 2017. Sad, but not having life insurance is the responsibility of both parents and its not that expensive – £70 a month in my case. Terms of your mortgage will most likely require you to take out life insurance to cover the cost of the mortgage. When I bought a house, I factored in all the outgoings including life insurance. Plus knowing if I die tomorrow, my family won’t be homeless and will have lots of extra cash left over is reassuring. Now the gofundme begging bowl goes out to fund their previous lifestyle. Sorry to sound harsh, but the gofundme culture is getting tedious. I suspect life assurance is part of a standard RBL package… which means that crowdfunding is probably completely unnecessary. A phone call to their HQ would give the Herald the answer. Just hope the current Brexit hysteria does not result in Jacky and Mia getting kicked out of UK. Well if it turns out he did have life insurance that would be great. But let’s be honest who thinks about taking out life insurance when they’re 40 – I certainly didn’t. The reason I’m one of the hundreds of people who have contributed to this GoFundMe appeal is because I knew Tristan, he was a really nice guy and his little baby daughter is going to grow up without ever having known her father. It’s a tragic story and Dave S and Regional are really showing a lack of empathy with their comments. Rather resent the ‘lack of empathy’ jibe. I was merely pointing out that it appears likely that there will be a death in service benefit. It’s normally three or four times an employee’s annual salary – so probably a six-figure sum. Suggesting that’s checked out is possibly more helpful than a tenner in the hat!